Dr. Amy B Facofp-Capoocia, DO is a Doctor primarily located in Hudson, FL, with another office in Spring Hill, FL. She has 14 years of experience. Her specialties include Family Medicine. She speaks English. Dr. Facofp-Capoocia has received 2 awards. The overall average patient rating of Dr. Amy B Facofp-Capoocia is Great. Dr. Amy B Facofp-Capoocia has been rated by 23 patients. From those 23 patients 5 of those left a comment along with their rating. The overall rating for Dr. Amy B Facofp-Capoocia is 4.0 of 5.0 stars. This Dr. when talking to me about my husband was very condescending and unsympathetic and also she really did not take good care of husband in hospital. She definitely needs lessons in understanding taking care of the patient as a whole also means working with the family and not being a nasty ........I would not wish her on an enemy! Also, DO NOT let her try to give you an adjustment, as it will only make you worse! They get you in the same day when you are sick. Regular visits are very thorough as well. The staff was one problem and getting access to the doctor is really difficult. Just to get a quick question answered, you need to make an appointment. I much prefer my old doctor and will be returning to her. We are sorry, it looks like we don't have insurance information. Please call Dr. Amy B Facofp-Capoocia's office for more information. Dr. Capoocia is Board Certified in Family Medicine and received her degree in osteopathic medicine from the University of New England College of Osteopathic Medicine in Biddeford, Maine. She completed her internship and family practice residency training at St. Joseph Medical Center in Philadelphia. During her final year of training she served as Chief Medical Resident. Dr. Capoocia is a member of the American Osteopathic Association, American College of Osteopathic Family Physicians and her local and state society medical organizations. She participates with the Hernando County Sexual Assault Victim Advocate Team and has served her community through lectures and community projects. She is on active staff at Spring Hill, Brooksville and Oak Hill Hospitals. 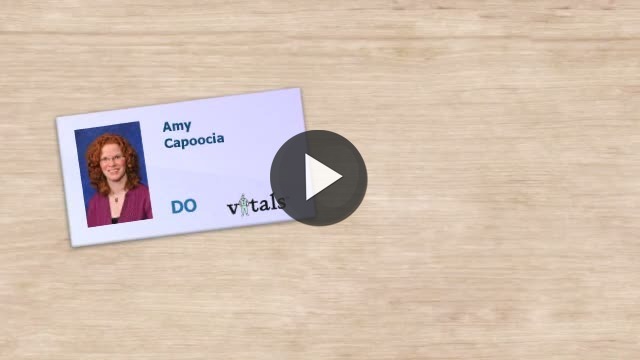 Take a minute to learn about Dr. Amy B Facofp-Capoocia, DO - Family Medicine in Hudson, FL, in this video. Dr. Amy B Facofp-Capoocia is similar to the following 4 Doctors near Hudson, FL. Have you had a recent visit with Dr. Amy B Facofp-Capoocia? Select a star to let us know how it was.